Since 1991, Homeros has been a popular place with travellers. It is located in the old (and quiet!) part of Selcuk town with a splendid 360' view from the rooftop terrace. From the rooftop terrace, you can see all the sights and plan how you will visit them all: St John's Basilica (100m walk), Isa Bey Mosque (200m walk), Artemis Temple -one of the 7 Wonders of the Ancient World (300m walk), the Museum (150m) and Ephesus (3km). 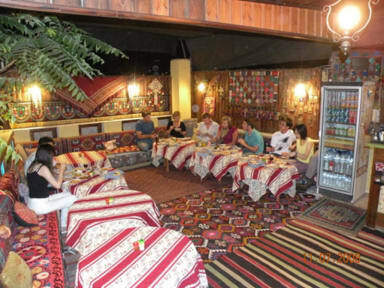 Come to Homeros for the location; you will stay for the delightful Turkish family experience. Then you will find it hard to leave Selcuk and the Homeros. Rates include a great breakfast to start the day. Dinner is optional (cooked by Momma). The clean and comfortable rooms are individually decorated with local antiques, most have en-suite bathroom and air-condition. Homeros provides transport to Ephesus, bicycle use and free Internet (wireless). Your host is Dervis with his family. Amazing family run mansion. They were one of the most lovely people I've met. The upper terrace had the fire going which kept us all nice and warm. The staff had a good command of English which was great. Only thing was I had to pay in cash and if you are cash poor, make sure you plan for it. Would def stay there again! Charming place with super nice owners. Can hardly believe the quality of stay I received for the low price I paid for a private room. Wow. I really like the host lady. Homerus is located with many other guest houses/hostels/accommodations next to the tourism office (helpful guy in there) and across the street from the bus/dolmus station. Good area to be. City construction during my stay so electricity cut out for a few hours in the neighborhood. Tips for city - Ephesus museum closes at 5pm in off season! I missed it sadly. Great little spot, well located and beautifully decorated - after a myriad of really bland, generic hotel rooms I've experienced here in Turkey for the most part it was a pleasure to spend a couple of days in a place that actually shows off the textiles etc. that can be found here. Oh and sheets that fit the bed:) Thanks, guys. great place... authentic turkish home feeling, with the others mother greeting us and providing us breakfast and wonderful hug and tour of the hostel. the view on top of the hostel was the best, great place, near the walking street with all the foods and near the bus station and ephasus, all near bye and the owner called his own contacts to get us around the place fast and simple and telling us what not to buy and what to buy and what to avoid to save money. Great pension that truly makes you feel at home. Walking distance to all of the main sights in Selçuk and also a long walk or short drive to Ephesus. The breakfast in the morning is great. :) I would recommend staying here. We had a lovely stay here - the room (for four people) was quite small but it’s worth it for the company and atmosphere. 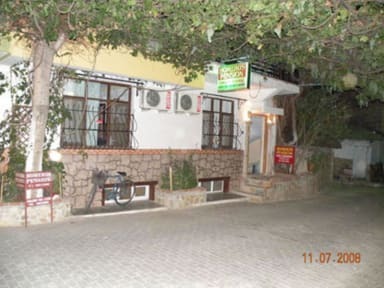 The hostel is located centrally at the town of Selcuk: it is very easy to get to Ephesus, bus station and train station. The room and community area are decorated in a Turkish style. It is very special because I am just like living in someone’s family. However, there might be some corners covered with dusts in the room. The bedding was nice and I slept like a baby. The bathroom was clean, yet small. The breakfast they provided was with a lot of fruit and jam. The hostess was helpful, too.